Thanksgiving is not very far. 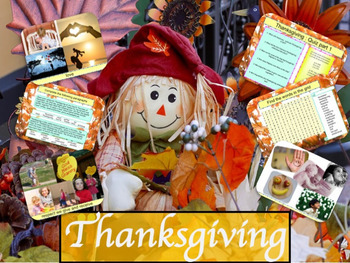 Here is a colourful powerpoint presentation with 35 slides for assemblies or simply for a lesson around Thanksgiving in November. 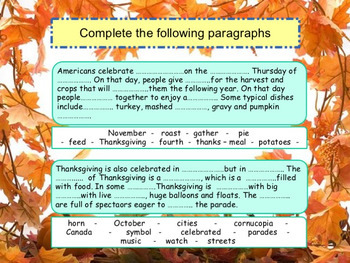 It can be used either at the beginning of the month to allow students to prepare Thanksgiving activities or right before the 4th Thursday of the month. - a recap to make sure students have understood the video. 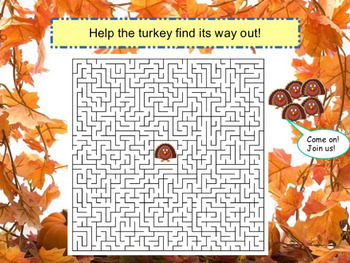 - a plenary that invites them to prepare activities around Thanksgiving. 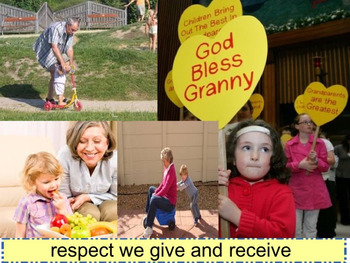 Please go to your My Purchases page (you may need to login). With each purchase you'll be able to provide Product Feedback. Each time you give feedback, TPT gives you feedback credits that you use to lower the cost of your future purchases. I value your feedback greatly as it helps me determine which products are most valuable for your classroom so I can create more for you. Follow me button to become a follower. You will now receive email updates about my store.